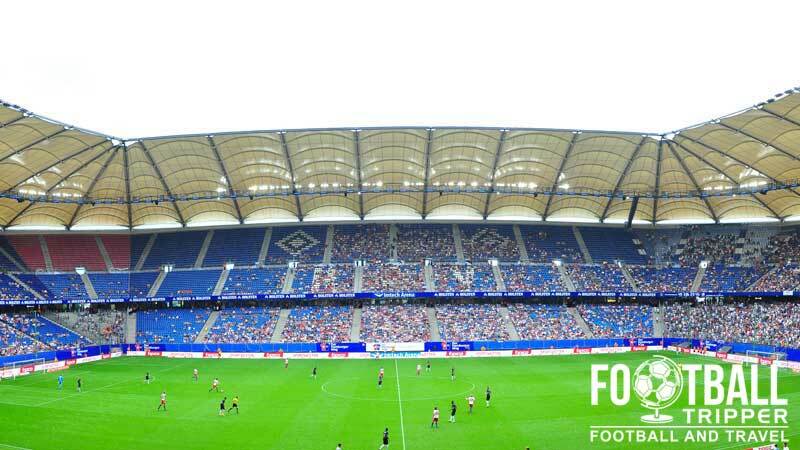 Volksparkstadion currently known as Imtech Arena for sponsorship reasons has been the home of Bundesliga side, Hamburger SV since 1953. The 57,000 capacity following the 1998 renovations allowed the ground to be used as one of the 12 stadia used in the 2006 World cup in Germany. 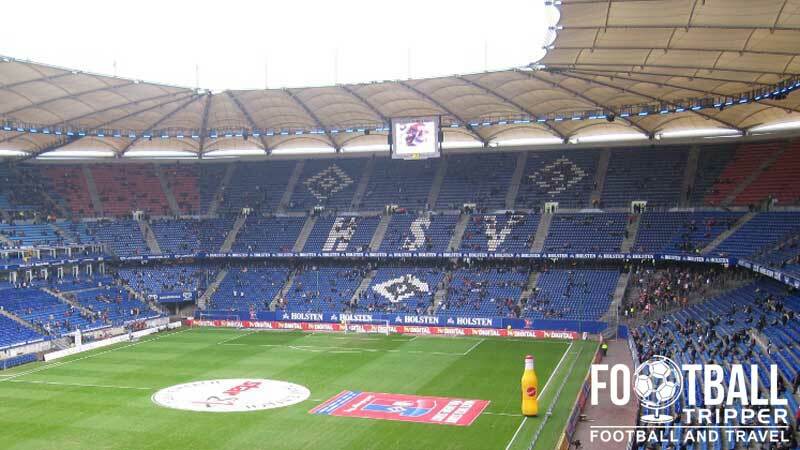 The Hamburg Arena has undergone several name changes since it opened in 1953 with the original name of Volksparkstadion (People’s Park Stadium) lasting until 2001 until the commercial realities of running a top flight football club caught up with Hamburger SV. Volksparkstadion has had three sponsorship names: AOL Arena (2001-2007), HSH Nordbank Arena (2007-2010) and currently Imtech Arena (2010 – present). The stadium was built in 1953 to replace the crumbling Altona Stadium, and the new 65,000 capacity stadium was used as part of the 1974 Fifa World Cup. It hosted three group matches, all of which contained the host nation including a tight encounter between East and West Germany with the “away” side defeating the hosts 1 nil. Until the reconstruction in 1998 the “Old Concrete bowl” was amongst the most unpopular stadiums in Germany with fans dissatisfied with the lack of adequate roofing, and restrictive athletics track around the perimeter of the pitch. The common complaints led to the vision of a “autonomous, and purely football” Arena Project. Consequently the old stands were demolished with the pitch rotating 90 degrees to allow better sunlight onto the pitch. 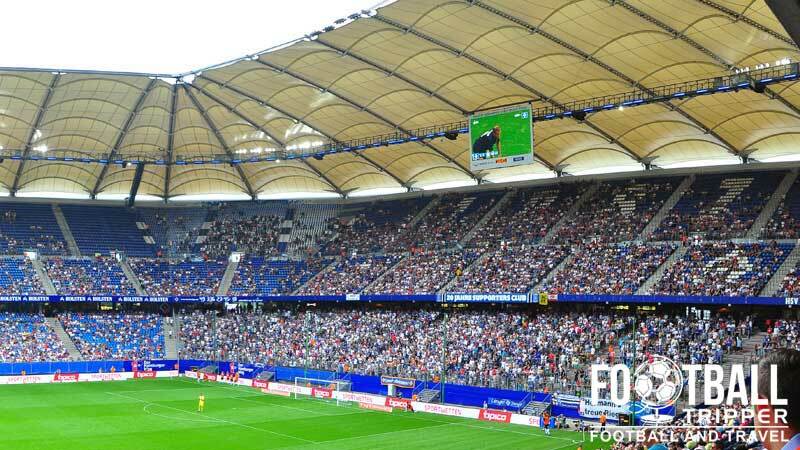 The estimated cost of the new stadium was €90-100 million and Hamburger SV purchased the ownership of the ground outright from the council in 1998 to symbolically mark the start of a new area. The project came in slightly over budget which may have been the driving force of the naming rights sale in 2000. The Imtech Arena today is considered a UEFA Elite Stadium, and it hosted four group games in the 2006 World Cup as well as a quarter-final match between eventual winners Italy and Ukraine (3-0), although it was referred to Fifa World Cup Stadium Hamburg for sponsorship reasons. It also hosted the 2010 Europa League Final between Fulham and Atletico Madrid with the Spanish side winning 2-1. Imtech Arena can be thought of as four separate sections: Nord Tribune, Ost Tribune, Sud Tribune and West Tribune. Away fans are housed within a section of corner seating between the southern goal-end and the West Tribune. 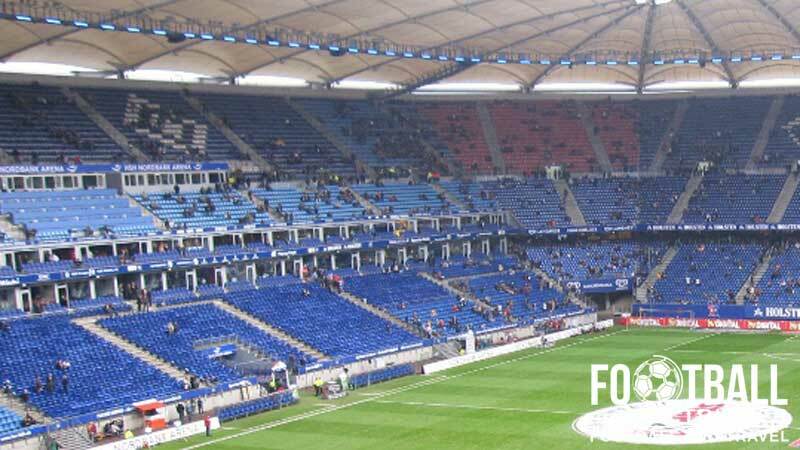 By default travelling supporters who make the trip to Hamburg are housed within the two lowest tiers of this stand and are given two ways to watch the game: seating or standing. The ground tier is basically a terrace whereas the second tier offers fans standard seating options. Although the corner of any stadium isn’t the most desirable location views from this part of the ground are generally impeccable as the cantilevered roof design ensures that there are no restricted views. As is the case in Germany, away fans inside the Imtech sit opposite the most vocal section of Hamburg fans who occupy the north stand which means the stadium is filled with noise throughout on matchdays. The city of Hamburg is famed for its nightlife and as a stag destination across Europe and you certainly won’t be disappointed by the selection of bars once you have arrived. Naturally the city centre has more sports bars and Irish pubs but there are two noteworthy boozers close to Imtech: Catonium and the Carlsberg Bar. As we’re in Hamburg it would be silly of me to mention where you can get a “decent” burger…and it looks like there is a McDonald’s just across the other side of Altonaer Volkspark. Within the concourses themselves there is of course the standard choice of fast-food options such as Frankfurters, Pretezels and Fries. Plus plenty of Pilsner. HSV operate 4 stores across the city of Hamburg as well as a official online store which means you can purchase your Rothosen (Red Shorts) no matter where you are in the world. The most convenient place to purchase merchandise for the majority of fans is at the Arena Store itself. Inside the Hamburg club shop, complete with view of the pitch. No testing the balls out though. For only €10.00 you can hoist yourself around the Hallowed Halls of Hamburg’s home, taking in top-secret trails and treasures such as the tunnel, the turf and the trophy room in a tour lasting approximately 75 minutes. Monday – Friday: 12.00, 14.00 and 16.00. To book your place on the tour you can either phone +49 (0) 40 4155 1550, email [email protected] or visit the website listed above. 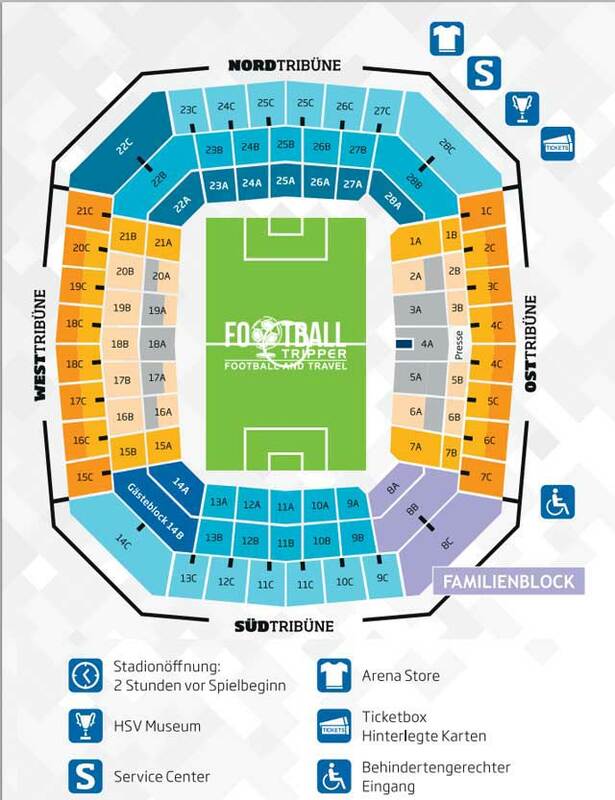 Tickets to see HSV play football can either be purchased Online, via Phone on the Hamburg Hotline (+49 (0) 1805 478 478) or at one of the four official stores located at the stadium and throughout the city. Price wise HSV tickets deviate slightly away from the Bundesliga norm by operating a four tiered pricing structure with classifications starting at C and going up to A+. The cheapest category (C) offer standing tickets for just €16.00, €20.00 behind the goal and up to €55.00 for a central place near the half way line. The most expensive category (A+) are almost double in price at €40.00, €94.00 for identical seats although there is some suggestion that terrace prices stay the same which is a nice move. Altonaer Volkspark where Imtech Arena is located is exactly 9km North-West of Hamburg’s city centre which maps often mark as being between Neustadt (New town) and Altstadt (Historical city centre). The exterior of Imtech Arena. Imtech Arena is less than 1km away from the A7 stretch of motorway which traverses both North and South of the city, making it very accessible via car. Look for the Hamburg-Volkspark exit and then follow the signs to the stadium. There is a large car park located 2 minutes west of the stadium which is accessible from Hellgrundweg road. Although it is large it does fill up quickly on matchdays, and we’re not currently sure how much it costs. Hamburg Hauptbahnhof is the main train station of the city and is located very centrally, slightly North of waterfront part of town, to the right hand side of the Außenalster (Outer Alster) Lake. The main platform of Stellingren Station which is the closest tram stop to Hamburg’s stadium. On matchdays fans can catch a shuttle bus service from Stellingen station directly to the stadium, with an similar service also running from Othmarschen station with both stops located on the S11, S3 and S21 lines of the S-Bahn. Alternatively you can choose to walk the distance, which will take you no more than 15 minutes by foot. Hamburg International Airport is around 11km North of the city centre in pretty much a straight line and takes around 22 minutes to drive via car with moderate traffic. As the fifth largest airport in Germany based on passenger numbers, Hamburg is a well connected destinations with over 60 airlines serving over 125 destinations. Once you have landed and grabbed your luggage you can travel to your hotel in the city via the S1 line of the S-Bahn which is a cheap and efficient form of ground transportation. Whilst there aren’t any hotels within the grounds of Altonaer People’s Park, there are a few located on surrounding roads with the Arena Hostel Hamburg to the north of the stadium the highest rated choice and only a 10 minute walk away. The historic centre near to the waterfront has seemingly endless options with the Hamburg Marriott Hotel (expensive), Hotel Bee Fang (Cheap) and Hotel Lumen (in between) all well located near to the main train station of the city.